Ancient clothing has always been towards simplicity and there has not been any variance as far as the style and the fashion trends are concerned. They woe clothes basically for the purpose of just covering themselves and keeping their body covered with the fabric. The famous Greece clothes are one of their kind and they are unmatchable as they are different from the various varieties of clothes available in the world. 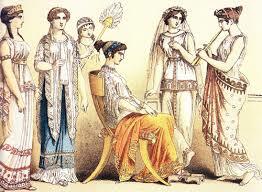 The basic ancient Greece clothing includes chintos, peplos, himation and chlamys. The clothing that once existed is now not in real existence and they now are present in artistic books and ancient history. Men clothing varied from women clothing basically in terms of length, the robes that men wore were knee length and women gown dresses were ankle length. The Greece clothing was basically lengthy fabrics of linen or wool; they did not consisted much except for some ornamental pins or belts which were tied to hold the dress and keep it gripped at the required position. Among the various prominent Greece clothing, chintos was that one different kind of cloth which was commonly worn by both the genders and by people of all ages. It somewhat resembles a tunic that presented a pleated look and it was sewn unlike some other basic wrap up Greece clothing. It generally was made up of light linen fabric which made it a dress of all season. In men again, chintos were found to be knee length and ankle length for women. Peplos was the ancient typical Greece clothing for women. Peplos unlike chintos was not a sewn fabric, instead it was draped in a different style where the tube shape fabric was worn and folded in a way in which it covered the women body to the ankle length. Peplos was a costume which was draped around the body and two folds basically where a belt was tied in the waist that supported the dress, and on the other hand it was pinned up at the shoulders to make the dress stand on the body. It was basically open on one side of the body and draped all around the body. A himation was yet famous ancient Greece clothing, this is basically that one type of clothing material which is worn not over the body but over yet another tunic. It is basically over wear Greece dress which was naturally worn over chintos, it made the dressing look heavier as the material with which himation was made was with a falling kind of light fabric which had lots of pleats which made it a heavier drape. Apart from this, ancient Greece clothing included chlamys which was largely worn over some other clothing item, but was also worn singularly as well. This type of clothing was made with woolen fabric and it just consisted of a rectangular piece that was tied, or pinned on the right shoulder. It was basically hanged over the body and tied on one side; it was a typical Greek military wear.